In the last days, Matthias Rustler (mazze) get the full sources from Eric (author of muibuilder) of his muibuilder programm and muibuilder.library (which allow to generate source code). 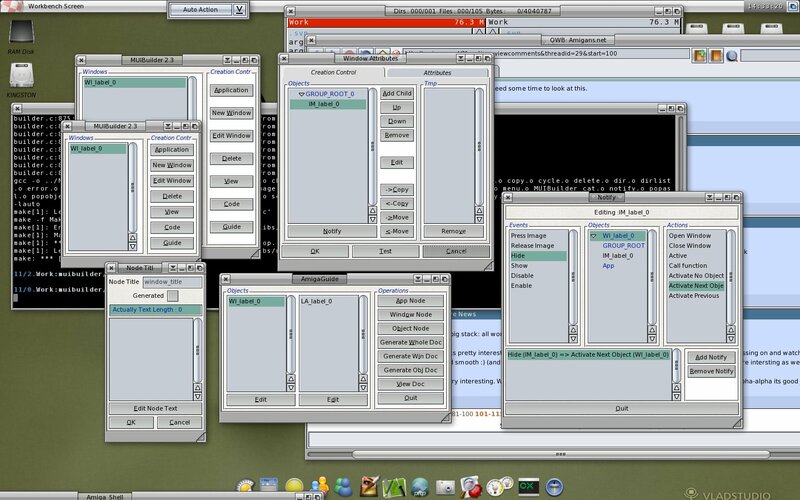 He create a SF page here, for making muibuilder cross-platform beetwen all the amigalike oses (just like before was with Zaphod , or as Yannick do for AmiFig). And as usuall i adapt it a bit for aos4 (it hardly to say "adapt", because all the hard work already done by mazze, all what i do, its create a makefile for aos4, comment out few includes which not need for us, and add opening of muimaster interface in main file, that all). You are a sport, kas1e ;-). Great work! Nice port. thanks kas ! Isn't there already an icon for it? ;^) At least I've got one in my installation. I dislike retro/ugly icons at all :) (kind of defailt one on SF page, but i am sure almost the same was on 68k). Anyway, icons from Mason for sure will be better in any way and more modern. Btw, you use before 68k version ? Or someone already compile old sources for os4 ? With the OS4 version of MUI probably being the most technologically behind, I don't really see any point in this program at all, as builders from OS 3.x will do the exact same job. It would be nice to see a coordinated effort to bring the MUI sources up to date on all platforms, as well as a gui builder tool. I used the 68k version before. AFAIK you're the first one to compile a native OS4 version. Thanks a lot for that. In theory MUI 3.9 could be available for OS3/m68k for a long time by now already, but due to licence restrictions we are allowed to release MUI 3.9 for OS4/PPC only. Perhaps stuntzi can be convinced to cancel that restriction. Then MUI 3.9 for OS3/m68k can be released instantly. However, MUI 4.x is a completely different story. The MorphOS developers don't want to share this one with anybody else. With only difference, that its not the same old 68k sources, but modified ones, and in progress (soon mazze want to add XML support, to avoid usage of muibuilder.library), as well as some bug-fixing. Of course for os4 maybe will be better to have reaction-based builders, but on os4depot i see only one, which are buggy, and that one from ADVtools are not ready and when it will be done for public no one know. Not the latest moment that 68k its 68k, and aos4 native its native, it always right to have native programs. It would be nice to see a coordinated effort to bring the MUI sources up to date on all platforms, as well as a gui .builder tool. Imho at this point its impossible. Because morphos developers put to mui4 too much effort already, and they do not want to share one of the uniq mos features with others. So, while on aos4 we have mui3.9 only (and looks like will not have mui4 official, if only Hyperion will not try somehow again to ask initial author about, for maybe just initial mui4 version, not the current one), 3.x based muibuilder which are in actual developing can be helpfull for some devs who want to use mui , but not reaction.